The 3-4 Bedroom House Kit provided by Moving Ahead Services offers a cost-effective means of packing up the entirety of a house with three or four bedrooms. 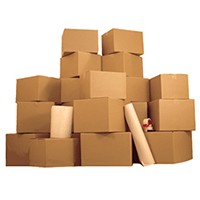 Included in the kit are 45 small boxes, 45 medium boxes, 20 large boxes, 10 extra large boxes, six 24” grand wardrobe boxes, 10 rolls of tape that are 55 yards each, and 50 pounds of packing paper. All of the quantities for each item included in the kit were established based on research and our own observations from working in the field. Each of the boxes is built from strong and durable cardboard that will help keep your belongings safe while in transport during your move. 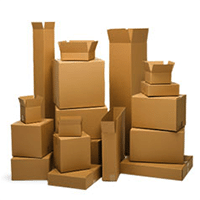 The small and medium boxes will generally be most suitable for electronics, DVDs or CDs, office supplies, toys, collectibles, toiletries, and more miscellaneous belongings, while the large and extra large boxes are better for books, pillows, linens, lampshades, kitchenware, and small appliances. The grand wardrobe boxes, of course, are intended for your clothing, and the tape and packing paper is for packing your belongings with secure protection. 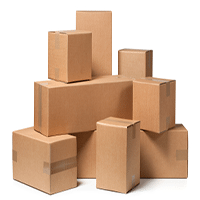 Customers enjoy our kits for their convenience and the peace of mind they bring by guaranteeing plenty of packing supplies that will protect all of your belongings. Not to mention, the kits usually save people money that they would otherwise spend on individually purchasing each portion of their desired supplies and repairing or replacing items that would be damaged due to poor protection. You will also save a lot of time and stress by purchasing a kit, as you will not need to go around trying to scrounge up supplies or realize at the last minute that you are bereft of something you could really use like packing paper. We have yet to encounter a customer who was disappointed with our three to four bedroom house kit.